I looked at the earth, and it was empty and formless. I looked at the heavens, and there was no light. Theoretically there should be no light, according to the verse. 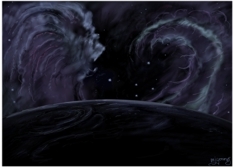 However, without any light at all you wouldn’t see anything, so I had to draw some light, in the form of a glow that illuminates the gas nubulae in space & the clouds of the earth, at the bottom of the scene. The picture shows a scene from orbit, above the earth, with outer space stretching out beyond the planet. This verse is a reference to Genesis 1:2 “The earth was empty, a formless mass cloaked in darkness. 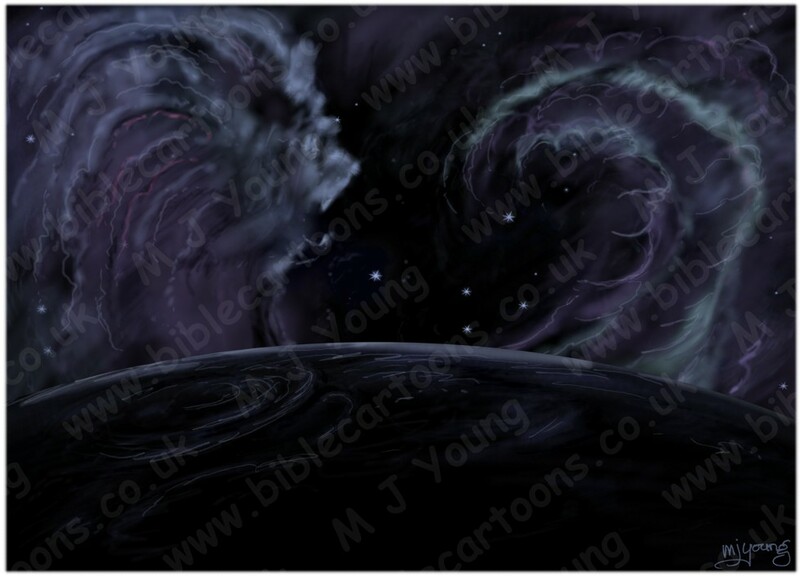 And the Spirit of God was hovering over its surface.” As I drew this scene, & just let it develop itself, I noticed that the left hand nebula looked like a male lion, in profile, with it’s mouth open – roaring, perhaps, looking towards the right hand side of the picture. That seemed intriguing, & appropriate: like Aslan the lion, from the Narnia books. Aslan is a metaphor for Jesus Christ, who, of course, was present at the beginning of the universe & instigated its creation. The right hand side of the picture is some sort of nameless creature, perhaps something like a caterpiller, or larva, or other creepy crawly creature! It perhaps represents chaos, or satan, or some such thing.